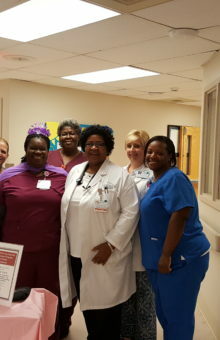 Bladen County Hospital is celebrating the promotion of Sheila Smith, CNA II. Miss Smith is the hospital’s first Nursing Assistant to obtain CNAPP Level II. She was also in the first graduating class of the Bladen Support Academy in 2016. The Cape Fear Valley Health System Certified Nursing Assistant Advancement Program (CNAAP) provides an advancement framework to recognize and retain Certified Nursing Assistants II who provide direct patient care. CNAAP participants are involved in demonstrating excellence at Cape Fear Valley Health through ongoing learning, supporting the organization, and promoting the health of the community. Participation in the CNAAP is voluntary. Advancement is an achievement, not an expectation. The CNAAP consists of 3 levels: Level II, Level III and Level IV. Miss Smith joined the Bladen County Hospital Medical Surgical team in 2006. She received her Nursing Assistant Level II from Bladen Community College in 2010. Miss Smith not only provides care as a nursing assistant, but serves as the Unit Clerk. Some of the activities involved in successfully meeting the CNAPP Level II criteria included being an active member of the Infection Control Committee, volunteering at the Bladen Crisis Center, and obtaining contact hours such as documentation class and education sessions online. 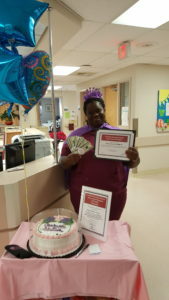 The Bladen County Hospital Staff congratulates Sheila Smith, NA II on this achievement!